UPDATE: The online petition now has more than 2,500 signers. PhillyVoice will do a story later today about the poll toward the bottom of this story, so check back later for results. A post-pope weekend proposal for car-free Center City weekends is getting better traction than a 33-speed mountain bike. There’s an online petition – nearing 1,500 signers in just a few hours -- rooted in the city’s cycling community calling for the approval of three such weekends during the summer of 2016. The petition is addressed to Jim Kenney, the Democratic mayoral candidate and presumptive next mayor. “Security measures, which limited… vehicles, opened up our streets in new and unforeseen ways. Rather than feeling hampered… residents and visitors alike got a taste of freedom. “Children played in the street, couples strolled hand-in-hand, visitors sang songs and bike riders delighted at the strange ease of moving around the city. Kenney, likely the next mayor based on registration and voting patterns, thinks the idea is worth considering. But maybe not three weekends and first with additional input from those who’d be affected. “I'm confident we can find a system that occurs with the appropriate frequency and scale, so that we're balancing the need for convenience with all the benefits that come with more pedestrian and bike friendly streets,” said Kenney. Messages seeking comment from his Republican opponent, Melissa Bailey Murray, and sitting Mayor Michael Nutter were not immediately returned. The city has added many bike lanes in recent years and shuts down Martin Luther King Drive on weekends. “We would be happy to take part in that conversation and support the city in any policy decision,” said the PPA’s executive director. “Successful cities need integrated, multi-modal transportation systems,” he added. A video produced by independent journalist Cory Popp of Center City during it's car-free weekend for the papal visit has already attracted 15,000 views. Kenney, a former member of City Council who walked throughout Center City during the past weekend, said an open streets program in Philadelphia “is something I've thought about for the last several years." New York City has had an open streets program in parts of the city each year in August, based on the open streets program in Colombia. “Bogota has a great model that I'd like to look at replicating, but I also want to get feedback from everyone affected by this weekend's open streets experiment,” Kenney added. “I like the idea, but I don’t see it happening,” said Ed Grose, executive director of the Greater Philadelphia Hotel Association. “You need to think about who is affected. It wouldn’t be the ‘traffic box’” and thus not as onerous, he said. The three-square mile traffic box zone created for the security of Pope Francis excluded most vehicle movement during the papal visit, discouraged casual visitors and adversely affected the bottom line for merchants cut off from many potential customers. “It would still create a challenge for us, getting customers to hotels, but we’d be open to making it work,” said Grose. He recalled that Chestnut Street traffic once allowed only buses and cabs, but that exclusion was jettisoned because of public objections. “Some may not accept the inconvenience,” said Grose. He pointed out that many Center City residents are older and not inclined to either walk or bike. Everett said “taking all transportation into account” is necessary for a healthy city and opening up smaller swaths of Philadelphia on a neighborhood-by-neighborhood basis for bikes and pedestrians would better address specific concerns. “If we did that, it would be hopeful and futuristic, not elitist or insensitive,” he said. He pointed out that many Center City residents are older and not inclined to walk or bike. Brandon Shaw, who works at a Bucks County-based agency promoting alternatives to cars, said a smaller traffic exclusion area with reasonable public transportation remaining in place, including links to the suburbs, is necessary to sell the idea. “The worst part of the (pope) weekend was that if you weren't already in the city and willing or able to walk or bike everywhere, it ended up being a weekend to stay home or flee town. But bicycle true-believers are convinced. 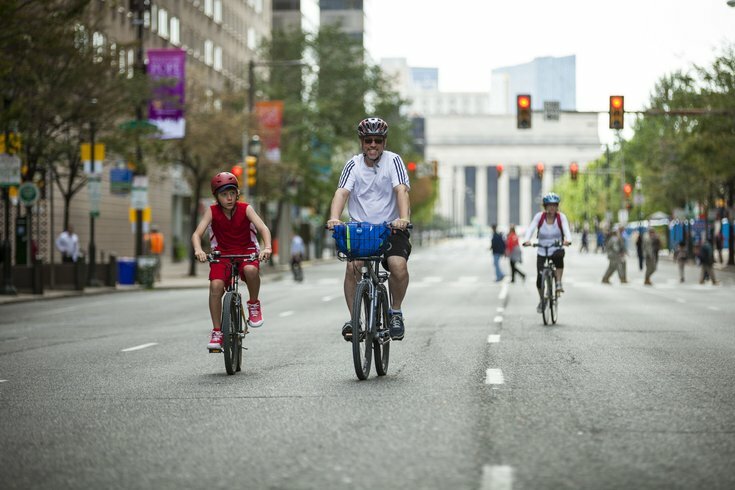 “What happened in Center City on Saturday and Sunday afternoons was a transformative experience for Philadelphia,” said Joseph Russell, who works at a Philadelphia marketing agency and bikes all over the region from his home in South Jersey. “Shutting down the streets to cars and opening them up for people is usually something you see in European cities and not auto-centric American ones. “But Philadelphia was not built to be auto-centric. When cars lost their dominance, people flooded the streets on foot or on bikes. “As for businesses getting hit, they got killed because the city and federal governments scared them away with doomsday traffic jam scenarios. “By shutting down most of the public transit in the region and closing highways, they negatively affected people's ability to get around far more than closing off a few streets in Center City ever will,” added Russell. Cannon hopped a PATCO train in South Jersey with a friend and their bikes on Friday, then pedaled 15 miles around Center City, reveling in the empty streets. “But there was a whole lot of joy in Philadelphia. Part of it was the pope. But part of it was the city without cars,” added Cannon. Should Center City ban vehicles on some weekends so that pedestrians and bike-riders can freely use the streets?